A rather subdued start to the day. The wind had dropped to a less intimidating 15knts, visibility pretty good and decent surface contrast, but cold -30C. It took 4 hours for Jean and I to get our stuff reasonably dried out and everything sorted. Mark was ready in half that time but patiently helped out. When we were finally set to go with just the tent to put down, Jean and I both had cold toes. Not good to start without sensation so we worked hard to get the feeling back which means taking off ski boots, massaging toes, putting them under each other arm pits, hot water bottles, and running around. Mine came back quickly but Jean’s took a little longer. Thankfully he regained sensation and we were ready to go. Launch went smoothly, but the surface we were traveling over was brutally bumpy and hard. We entered a region known as ‘the sastrugi national park’. The wind-blown snow sculptures are quite beautiful, but are a real nightmare to kite over. Total concentration is required at all times and some of the bumps were big enough to stop the pulk dead, requiring vicious kite loops and a bit of airtime to get them going again. With less wind than yesterday and a slightly different heading I was really struggling to find enough power to weave through the awful mess. I crashed hard a couple of times with the skis caught in sastrugi traps or the pulk stopping suddenly. We made continuous progress for almost 4 hours and were a little disheartened to have only travelled 30km. After a brief lunch break we set off again. Mark had fairly horrendous “kite-mare” on set off and had to walk back and forth to his kite at least four times to untangle twisted lines and thread the kite though itself. Our first of the trip, I’m sure there’ll be more! 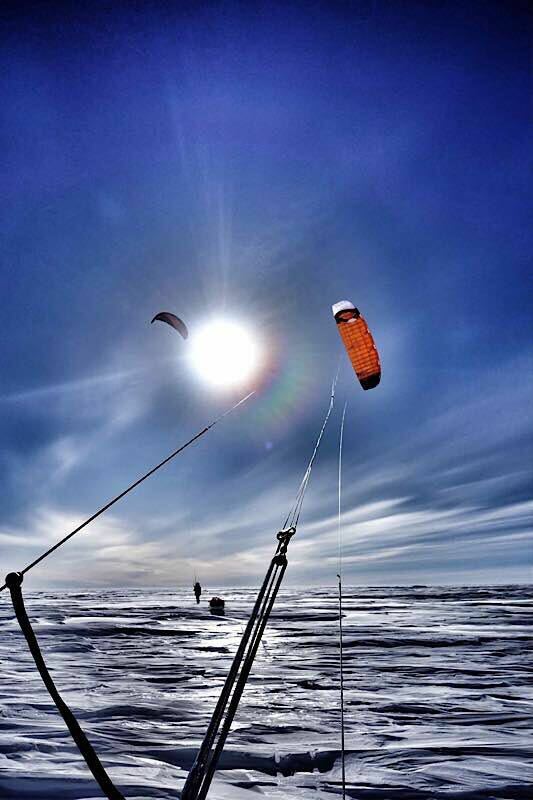 Soon after we spotted the flags that mark the line of the Mcmurdo – South Pole traverse. 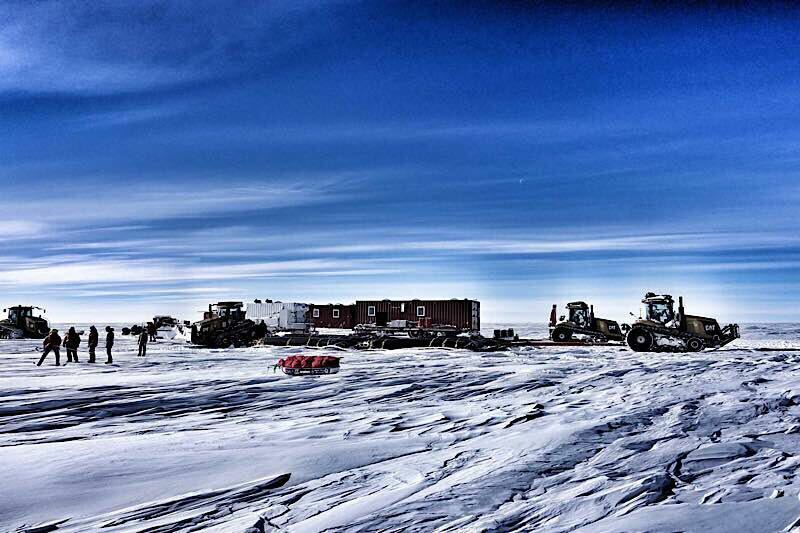 Basically a bulldozed road that is used to supply the massive American science base at the South Pole with fuel. There wasn’t much evidence of passage other than the flags which made navigation much easier. Then on the horizon we spotted the convoy, which looks very much like something from Mad Max, on its way to pole for the first time this season. As we got closer it was quite the sight. About 10 massive caterpillar tracked bulldozers each towing fuel bladders containing 240,000 gallons of Jet fuel. There were also all kinds of strange containers on skis that must be the cabins, workshops and a kitchen to service the 25 support staff on their 30 day journey each way. We stopped and had a brief chat before continuing. Then the fun really began! The thousands of tons of heavy machinery left a soft, relatively smooth trail in their wake and we were able to open up the kites and remember how much fun traveling at pace can be! We covered the next 30kms in an hour and half! Finally we stopped at 8.30pm to make our important ‘Sched’ call to ALE (our logistics provider) to let them know where and how we are. This is very important as if you miss the call they are on standby for a rescue and if you miss the next call 24 hours later they will launch a rescue. It’s a very considered system to keep us and the other expeditions out here safe. It was good timing as it’s not until you stop you realise how tired you are; Legs, knees and arms, but also the brain is drained from so much concentration. Now it’s midnight and we’re bedding down. Well, you wanted an adventure! It sounds horrendous kiting over the rough surfaces. Great to get these daily reports. Wishing you all the best, and hopefully some nice “easy” kiting weather. All sounds very tiring. At least you are travelling, let’s hope the weather allows you to continue. Damn you guys are mentally and physically tougher than granite. Hope you have another big distance day tomorrow.